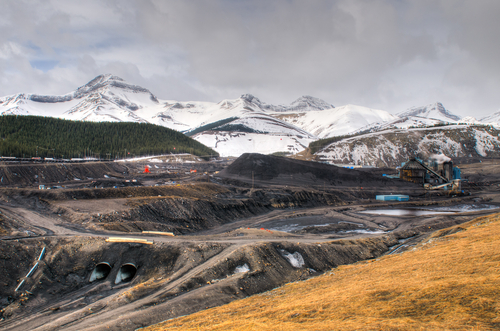 Coal mine in the mountains, Alberta, Canada. Click to enlarge. In An Average Year, A Typical Coal Plant Generates: "3,700,000 tons of carbon dioxide (CO2), the primary human cause of global warming--as much carbon dioxide as cutting down 161 million trees. 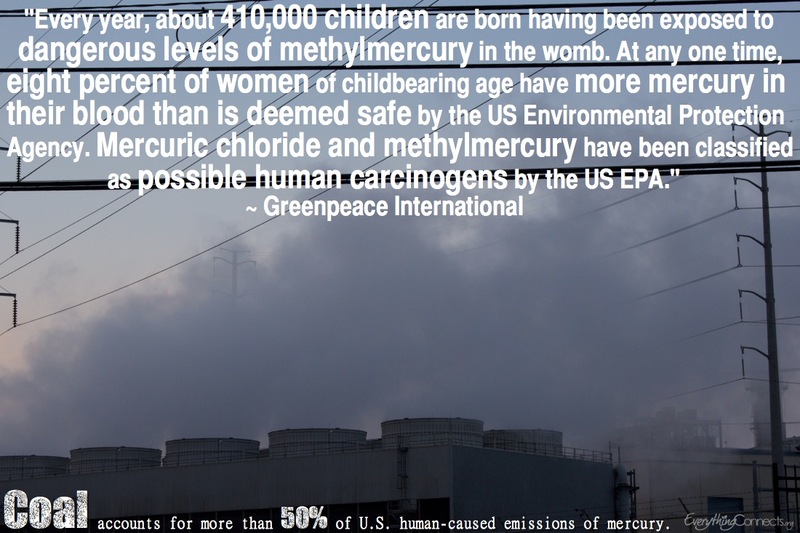 500 tons of small airborne particles, which can cause chronic bronchitis, aggravated asthma, and premature death, as well as haze obstructing visibility. 10,200 tons of nitrogen oxide (NOx), as much as would be emitted by half a million late-model cars. NOx leads to formation of ozone (smog) which inflames the lungs, burning through lung tissue making people more susceptible to respiratory illness. Oil and coal-fired power plants create air pollution damages that are greater than their value added (view study) (see also), greatly distorting markets. Burning coal contributes more to climate change than any other fossil fuel and is the biggest source of man made CO2 emissions driving the world to warm at an average of 3.5 million tons of CO2 per year, per coal plant, which at 1000 megawatts (MW) produces approximately the same amount of global warming as 1.2 million cars, and with a staggering total of 11 billion tonnes of CO2 emissions spreading from coal-fired power plants around the world every year. In the United States, coal is the largest single source of carbon dioxide in the country, burning more than a billion tons of coal each year, which is 20 pounds of coal for every person in the country every day, and is responsible for one-third of America’s carbon dioxide emissions, which is about the same amount as all transportation sources, including cars, SUVs, trucks, buses, planes, ships, and trains, combined. If current plans are given the green light to build new coal-fired power plants across the world, then coal will be responsible for 60% of CO2 emissions by 2030. According to the landmark Stern Review on the Economics of Climate Change, the potential cost of dealing with the climate change caused by this CO2 will be 20% or more of the world’s GDP by 2100. According to Greenpeace, "Worldwide, the 25 worst CO2 polluting power plants all burn coal. According to CARMA, these plants are responsible for over 570 million metric tonnes of CO2 emissions, the equivalent to the UK’s yearly fossil fuel related CO2 emissions. Those pedalling technological fixes - such as carbon capture and storage (CCS) create a dangerous distraction. It is only by quitting coal and increasing energy efficiency and production of renewable energy that we will prevent catastrophic climate change." Learn more. Coal-fired power plants emit large amounts of health-threatening toxins, such as arsenic, mercury, acid gases and lead, into the air every day, which in the U.S. alone can result in more than $100 billion in annual health costs and top over $345 billion in hidden costs, is responsible for over 127 million - more than 40% - people living in areas with unhealthy levels of air pollution, cuts short the lives of 30,000 people and causes 38,000 heart attacks, 12,000 hospital admissions and an additional 550,000 asthma attacks, which strike nearly 1 out of every 10 school children in the U.S., and is the number-one health issue that causes kids to miss school, especially on “bad-air days," particularly during the warmer summer months, as a result of power plant pollution. Coal may be traditionally thought of as “cheap” and “affordable,” but it's true costs burdening society and the environment outweigh it's narrow economic benefits and makes coal the costliest fuel for electricity imposing more damages on the U.S. economy than the electricity is worth. According to "Environmental Accounting for Pollution in the United States Economy," by the American Economic Review, which is among the most prestigious academic journals in economics, coal power is actually harming the economy. By modeling the physical and economic consequences of coal emissions of six major pollutants from 10,000 pollution sources in the U.S., the estimated "gross external damages" from the sickness and death caused by pollution in comparison to the value added to the economy is over twice as high as the market price for the electricity. According to the study, "Solid waste combustion, sewage treatment, stone quarrying, marinas, and oil and coal-fired power plants have air pollution damages larger than their value added. The largest industrial contributor to external costs is coal-fired electric generation, whose damages range from 0.8 to 5.6 times value added. Coal plants are responsible for more than one-fourth of GED [gross external damages] from the entire US economy. The damages attributed to this industry are larger than the combined GED due to the three next most polluting industries: crop production, $15 billion/year, livestock production, $15 billion/year, and construction of roadways and bridges, $13 billion/ year." According to Coal is Dirty, "Despite coal industry claims that coal mining creates lots of jobs, the truth is that coal mining employment has been declining for decades, due to increased use of machinery instead of manpower. In West Virginia alone, coal mining employment has plummeted from 126,000 miners in 1948 (who produced 168 million tons of coal), to just 15,000 miners employed in 2005 (who, with the help of machinery, produced 128 million tons of coal)." Furthermore, the Center for Disease Control (CDC) estimates that 12,000 coal miners died from black lung disease between 1992 and 2002. Sierra Club: The Cost of Coal. "Coal is the single greatest threat to civilization and all life on our planet." ~James Hansen, NASA's top climate scientist Learn more. ...and some embarrassing advertisement tricks.